Operation: Military Kids is a national initiative that designs programs for military youth to help them find positive ways to cope with the stress of their parents' deployment, and Ohio 4-H Youth Development has been a major provider of OMK programs since 2005. Summer is especially busy. "We provide kids' camps with a military flavor," said Theresa Ferrari, Extension specialist in youth development and Ohio 4-H military liaison. "We honor the fact that these kids are in a unique situation, and they love that they get to spend time with others like them." 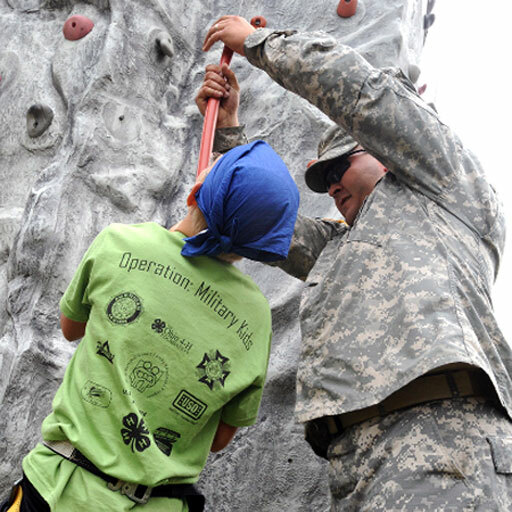 Each camp provides opportunities for youth to learn new things and have fun in an outdoor setting, while interacting with other military youth and military personnel who help staff the camp. These connections are helpful to children whose families are at any stage of the deployment cycle -- pre-deployment, during active duty, while a parent is reintegrating into family and civilian life, or during recovery from injury or death of a military service member. The interest in OMK camps and programs has increased since the first camp at Kelleys Island more than eight years ago. New camps have been added over time, and the OMK youth, teen, and family camp rosters fill up fast. A complete list and description of the 2012 summer camps is posted here. Ferrari said it's very likely that yet another family camp will be added in late August to accommodate a waiting list of families. Nationally, OMK is a partnership of U.S. Army Child, Youth, and School Services and National 4-H Headquarters. In Ohio, OSU Extension's 4-H Youth Development and Ohio National Guard Family Readiness and Warrior Support programs are primary partners of OMK. A variety of organization and corporate sponsors also support Ohio OMK. "Our work has evolved over time," said Ferrari. "Some partners enable us to extend our program options, and others help expand the number of (camp) attendees we can reach each summer." For example, the USO of central Ohio has provided a large gift toward camp expenses, and the USO of northern Ohio greets campers at a Kelleys Island welcome station. The Department of Defense -- Office of the Secretary of Defense has provided grants for the OMK camps as well. The American Red Cross of Greater Columbus and the Firelands Chapter provide disaster safety programming, school supply packs, and other support. The Ohio National Guard helps staff each camp and provides program support. Professors and students in the Ohio University School of Recreation and Sport Sciences provide program development and assistance with adventure camp activities. Local organizations and citizens get involved with camper community service projects. The bottom line? "We help give kids a positive association with the military," said Ferrari. Through OMK camps, these youth are "making memories" that help them deal with the challenges of being in a military family, she said, and all of Ohio's OMK partners help make this possible. The first 2012 Troop and Family Camp was held at Camp Joy in Clarksville, Ohio, on June 1-3. For more information, go here or check out "Ohio Operation: Military Kids" on Facebook.